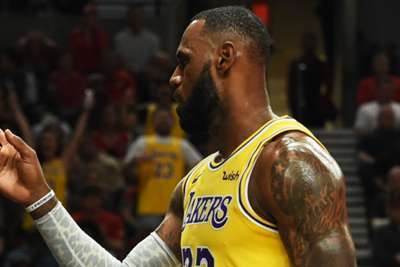 LeBron James made his home debut at Staples Center but it did not go according to plan after the Los Angeles Lakers lost a feisty game against the Houston Rockets. In his official home bow, LeBron and the Lakers were beaten by the Rockets 124-115 on Saturday. Despite the loss, Lakers superstar James still gave fans plenty to cheer about with 24 points, five rebounds and five assists. The clash descended into chaos in the fourth quarter after Lakers veteran Rajon Rondo and Rockets star Chris Paul exchanged punches. Lakers' Brandon Ingram also delivered some blows as the trio were ejected in Los Angeles. Veteran guard Kemba Walker had a performance for the record books. He now has the most three-pointers (19) through any team's first three games in NBA history, not to mention he sunk the game-winning free throw with 0.5 seconds on the clock. Walker pushed the Charlotte Hornets to a 113-112 win over the Miami Heat thanks to his 39 points. His game-high numbers also made him the first player to score 10,000 career points in Charlotte. Denver Nuggets star Nikola Jokic recorded a double-double in the team's 119-91 thumping of the Phoenix Suns. Jokic finished the contest with 35 points, 12 rebounds and 11 assists for his 17th double-double. His game-high performance came from shooting a perfect 11 for 11 from the field and three for three from three-point range. Jokic made all but one of his 12 free throws. Rookie Luka Doncic did not disappoint in the Dallas Mavericks home opener. He netted 26 points in the narrow 140-136 victory over the Minnesota Timberwolves. He played the most of any Mavs starter and had the totals to prove it. Doncic also grabbed six rebounds and dished out three assists. What time is it? Dame time. Damian Lillard had a game-high 29 points in the Portland Trail Blazers' 121-108 win over the San Antonio Spurs. The Suns were great in their season opener against the Mavericks, but on the road against the Nuggets it seemed like a handful of players left their game back in the desert. Deandre Ayton, Trevor Ariza and Ryan Anderson fell flat, as Devin Booker and Isaiah Canaan had to carry the weight of the starters. Ayton and Ariza had just five points apiece while Anderson finished with eight. Philadelphia 76ers guard JJ Redick was hot from behind the arc. He hit eight three-pointers against the Orlando Magic, including the game-winning shot with 17 seconds left. The 27-foot jumper pulled Philadelphia ahead of Orlando, 116-114. The Magic had a chance to send the game into overtime, but split a pair of free throws to push the score to 116-115 in favour of the home team. What more could you have asked from the Detroit Pistons' best sixth man? Only a diving layup to win the game. Smith led the bench players with 15 points and five assists. He also grabbed three boards. But what was most impressive was this shot with 5.4 seconds on the clock. Detroit topped the Chicago Bulls 118-116. Cleveland are still adjusting to life without their biggest star. The Cavaliers will host the Atlanta Hawks for their home opener and both teams are still looking for their first win. The Cavs have road losses to the Raptors and Timberwolves, but each contest was close with Cleveland losing by 12 points at most. Atlanta, who boast rookie Trae Young, have started on a similar path and they will continue their road trip looking to break a losing spell. The Hawks have been led by Taurean Prince, who has averaged 24.5 points through two games, and have been helped by veteran Vince Carter (11 points) and Young (17).